The spot gold price lost $21, or more than 1%, to $1,447 an ounce in early trade in New York on Tuesday. Gold has regained its footing since dropping $200 an ounce over two days to reach a multi-year low on Monday April 15 of of $1,326 an ounce on the back of bargain hunting, but buyers of coins, bars and jewelry may now be exiting the market again. Bloomberg quotes Feng Liang, an analyst at GF Futures Co., a unit of China’s third-biggest listed brokerage: "Retail consumers are very price-sensitive, so you don’t expect physical buying to go on and on, especially since we’ve come up more than $100 from the low. Those who missed the first opportunity are probably hoping for another round of declines." Gold is also being hurt by continued outflows from gold-backed ETFs since holdings in the popular investment vehicle hit a record high of more than 2,600 tonnes in December. Buying of gold ETFs played a huge part in gold's 12-year bull run – an ounce of the metal could be had for $330 when the first was launched. Holdings in the largest of the more than 140 gold ETFs traded on global markets, the SPDR Gold Trust or GLD, slid to its lowest level since September 2009 this week after a 12% decline in April. 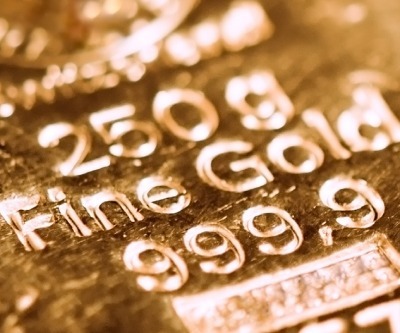 The gold price is down around 13% this year and April dramatic fall – the worst since the start of futures trading in gold – dragged the metal it into official bear territory, defined as a 20% decline from a high. From a technical perspective Tuesday's move below $1,450 an ounce could lead to further declines. The $1,450 level corresponds to a roughly 50% retracement of gold's dramatic losses mid-April.